I'm so excited! It's Christmas Eve! This is absolutely my very favorite time of the year, no question. I love this season for so many reasons, even when things are busy and crazy and I don't think it's all going to get done. I especially love the beautiful decorations and colors of Christmas and I don't really have a particular 'style' or favorite color scheme. 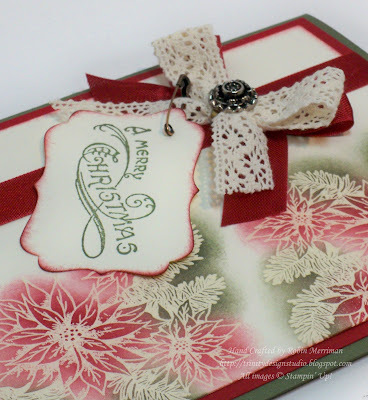 This card was one I created in October for my Stampin' Fools party group. I can't believe that I haven't shared it here with you all yet, but it's really perfect for Christmas Eve! I was teaching them the Emboss Resist technique and it just turned out beautifully on this card. 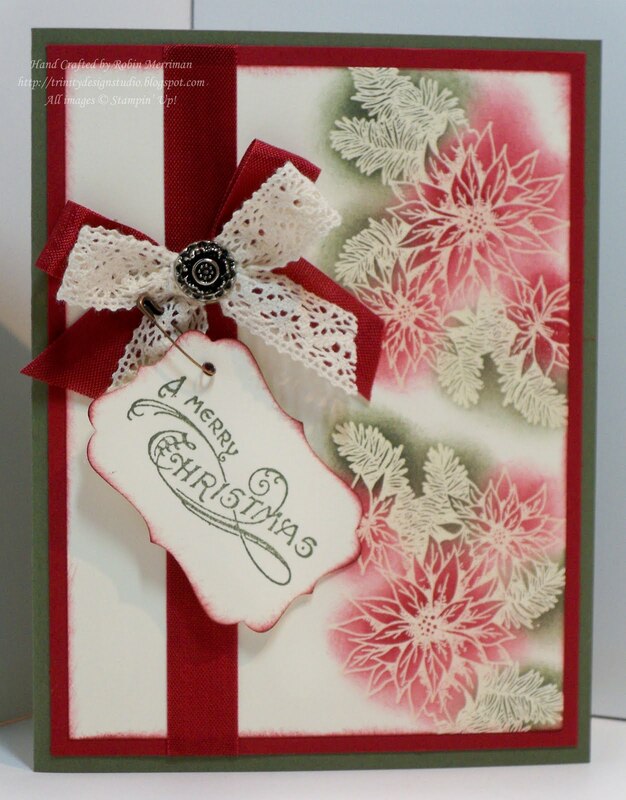 The floral/evergreen image was stamped with Versamark onto Very Vanilla cardstock and then heat embossed with Clear Embossing Powder and my Heat Tool. Then we simply rubbed Cherry Cobbler and Always Artichoke ink over the images with the Sponge Daubers to make the images pop off the cardstock. The ribbon treatment is just a combination of the Victoria Crochet Trim and Cherry Cobbler Seam Binding. We did a double bow and then wrapped it with an Antique Brad. The tag was stamped in Always Artichoke then sponged with Cherry Cobbler after being punched out with the Decorative Label Punch. I simply attached it to the bow with a tiny safety pin from the Vintage Trinkets. It's secured with a Stampin' Dimensional on the back. So, I don't know about you all, but I still have lots of fun Christmasy things to do today! I have Christmas Cards to write out and deliver at church tonight, a bit of shopping and cleaning to do, White Chocolate Cranberry Biscotti to make, and Grandma and Grandpa coming in this afternoon. Granny got here yesterday and took Emma out Christmas shopping last night while Mark and I braved the crowds at WalMart to get groceries. And in case you were wondering, we ARE getting our Christmas dinner from Target! Since the Thanksgiving meal was so super yummy, we decided to try the Spiral Sliced Ham one for Christmas and that means less time in the kitchen and more time with our parents. I'm really looking forward to this evening - we have Christmas Eve service at church and then as always, go out to eat at City Tavern in Manassas. We've had that tradition since Emma was 5 and we've not missed a year since I don't think. Yes, it may seem very busy on the surface, but I'm actually starting this day very relaxed and happy - I love that the focus is shifting from the busyness of this season to the warm coziness of home, faith and family. I do have one more post for you tonight, so I hope you'll come back and visit me over the next few days to see my special Christmas Card and message. I'll be offering Blog Candy too along with the other Stamping 411 Operators as a special Thank You to our followers this year. Have a great day everyone - Christmas Blessings to you all! This is a beautiful card Robin and I love this technique as it seems to make card have that vintage feel. I really enjoyed reading your blog and all the great things that are going on for you today. Merry Christmas, enjoy the day with your family and don't forget to take some time for yourself. Beautiful card! Wish I had seen it sooner, as I believe it would have been my Christmas card to everyone this year! Maybe next year...gorgeous!! thanks for sharing!